Dr. Gemma Robinson, Managing Director of Acorn Regulatory was among the speakers at the 2019 National Manufacturing Conference held on January 17th at the Citywest Hotel in Dublin. Dr. Robinson was speaking on the topic ‘Brexit: Current Agreements & Implications for Pharma & Medical Device Industry’. She was speaking at The National Pharmaceutical and Life Sciences Conference and Expo’ which was co-located at the Citywest, Dublin venue with The National Manufacturing Conference. 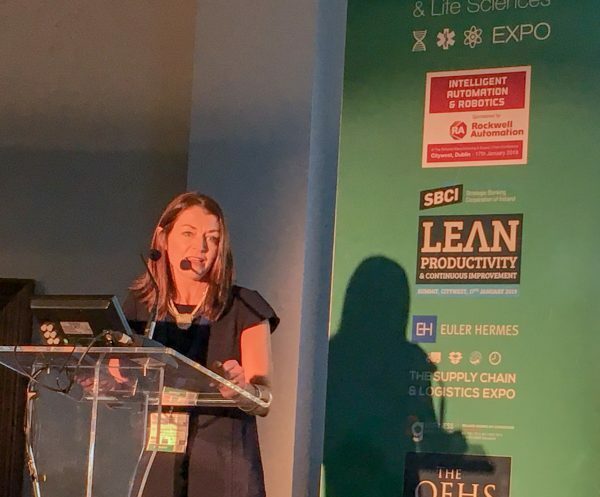 There were a range of other speakers on the day from companies such as Smurfit Kappa, Anecto, Exertis Life Sciences and BioPharmaChemical Ireland. The event is one of the biggest events in the Irish business calendar. The 2019 event welcomed over 9,000 attendees and almost 700 exhibitors over two floors. This year, the Acorn Regulatory Managing Director was asked to speak on the timely issue of Brexit. The event was held less than 48 hours after the UK Parliament held its ‘meaningful vote’. The presentation at The National Manufacturing Conference laid out the implications on drug availability and the licensing of devices, as is currently believed to the the case. Naturally, with votes and negotiations ongoing there is much to be decided. However, Dr. Robinson’s presentation looked at the potential outcomes and the measures that many companies are taking in an effort to best prepare themselves for a range of outcomes. Following the presentation there was an engaging questions and answers session with the speaker. The National Manufacturing Conference is just one of a range of events that Acorn Regulatory will be speaking at in 2019. Our expert staff will be presenting on a wide range of topics in Ireland and overseas. To read more about Acorn Regulatory please click here and to read more about upcoming events please click here.